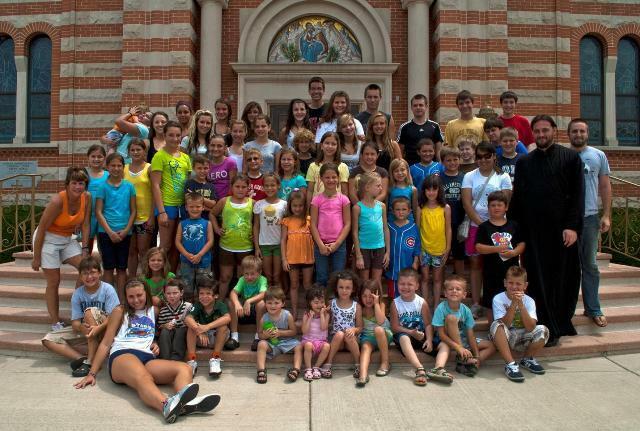 Merrillville, IN - St. Elijah Serbian Orthodox Church of Merrillville, Indiana held its annual Summer Church Camp 2010 the last week of July. Once again it was a huge success, but not without the help of many dedicated St. Elijah Church Members. truckload of fresh mulch on the playground that Pete Pomplin delivered. Many thanks to Mico Stojic, Vaso Stojic, Nick Bogojevic, Branko Ljuboja, Simo Stojic and Dusan Jelaca for volunteering their time and “muscles” to do this tough job the weekend prior to the children’s arrival. Church camp kicked off on a warm and sunny Monday morning, with the arrival of 50 campers and 12 counselors! What a great site to see so many eager and excited children ready to make new friends and have some fun! Teta Cindy Stojic, our Church School Director and Camp Coordinator greeted all the children and Rev. Fr. Aleksandar Novakovic, Cathedral Dean, began each morning by leading the children with Prayer, singing Srpska Narodna Himna and saying of the Pledge of Allegiance. Monday, Tuesday, Wednesday and Friday morning the children were divided into various age groups and rotated their time in religious classes in the church with Fr. Aleks, while culture sessions and kolo dancing sessions were held at the picnic grounds. Throughout the week, our Head Cook, Teta Mileva Savich, prepared delicious lunches and snacks along with several Mom and Baba volunteers. Thanks Teta Mileva, you and your helpers did an awesome job of keeping all the children well fed and hydrated during the hot weather! and Djuki Bukur. Each day ended at 5:00 with tired, sun-kissed faces ready to go home with their parents, yet anticipating the next day’s adventures. Tuesday morning, before we departed on our field trip, we had a special guest attend our church camp; Fr. Sasa Nedic of South Bend, Indiana spent the morning with Fr. Aleks and joined him during our religious classes. The children all enjoyed meeting Fr. Sasa. In the afternoon the children and counselors boarded the bus for our beautiful Dunes State Park located on the shores of Lake Michigan. The younger children stayed and played on the sandy beaches with their counselors and Moms while many of the older children tackled and conquered “Trail #7”. After they got quite a workout hiking the trails, the children really enjoyed swimming in the cool, but refreshing Lake Michigan water. On Wednesday our very own Choir Director, Dobrila Samardzich volunteered her time to prepare and teach the campers how to make their own Slavski Kolac. Our Head Chef Sladjan baked all the children’s kolaches in our hall kitchen making everyone hungry as the smell of freshly baked bread wafted throughout the hall during a thunderstorm. As the children snacked on their warm kolac, they soon forgot about the thunderstorms rolling through the area outside. Thanks to our hall manager, Milka Popovich, for keeping all the kids dry and happy and most importantly safe during the afternoon. The weather cleared by Thursday morning for the highlight field trip of the week to nearby Deep River Water Park. All the children had a “splashtastic” time as they tubed, slid down the many different slides, battled the waves in the wave pool and relaxed on the lazy river! A big thanks to the parents and counselors who supervised and took care of the children for the day! Our camp week wrapped up on Friday with just as much enthusiasm as it began because the children were anticipating the “Summer Camp Zabava” and “Extreme Water Games” lead by our own St. Elijah college student, Natasa Djukic along with all our High School Counselors. Camp logo and included on the t-shirts. Our 2010 camp was as successful as year’s passed and the children all went home with religious and cultural knowledge as well as great memories! Teta Cindy would like to thank all the high school and college counselors, cooks, helpers and Fr. Aleks for making this year’s camp “maximum fun”! She also would like to give an extra thank you to Mileva Savich for not only serving as head cook but also being our official camp photographer. See you next year.